For any further information, general enquiries or to make a reservation please contact us either by email or telephone or come and see us once you are on the island. 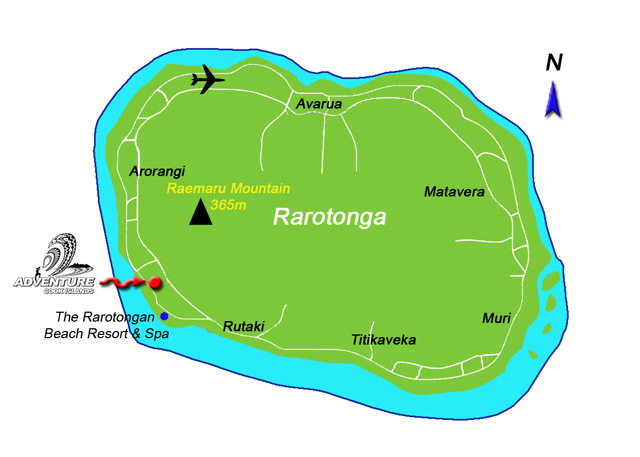 We are located on the south part of the west coast, between The Rarotongan Beach Resort and Rarotonga Backpackers. Our office opening hours are Mon – Sat 8:30 am to 5:00 pm, Sun 12:00 pm to 5:00 pm. Our time zone in the Cook Islands is GMT -11 hours. Our team at Adventure Cook Islands will handle all private information confidential, whether provided to us by email, telephone or any other means of communication. For all certified divers* enquiries, in addition to your enquiry, please add the following information to the MESSAGE field when filling out the form: number of dives, certification level, date of last dive. For scooter** enquiries, in addition to your enquiry, please add the following information to the MESSAGE field when filling out the form: drivers license class (1, 6, R, M, A, B, …), license issuing country. Please only click on SUBMIT once and wait for the page to load.